Definition at line 167 of file IVUsers.h. 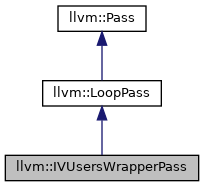 Definition at line 353 of file IVUsers.cpp. Definition at line 357 of file IVUsers.cpp. Definition at line 175 of file IVUsers.h. Definition at line 176 of file IVUsers.h. Definition at line 376 of file IVUsers.cpp. Definition at line 380 of file IVUsers.cpp. Definition at line 365 of file IVUsers.cpp. 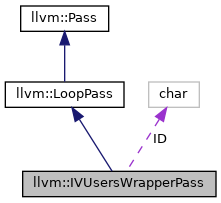 References llvm::LoopBase< BlockT, LoopT >::getHeader(), and llvm::BasicBlock::getParent(). Definition at line 171 of file IVUsers.h.